What do you do when you leave the Farmers' Market with your shopping bags stuffed full of gorgeous, seasonal, farm-fresh vegetables and no plan on how to use them all? 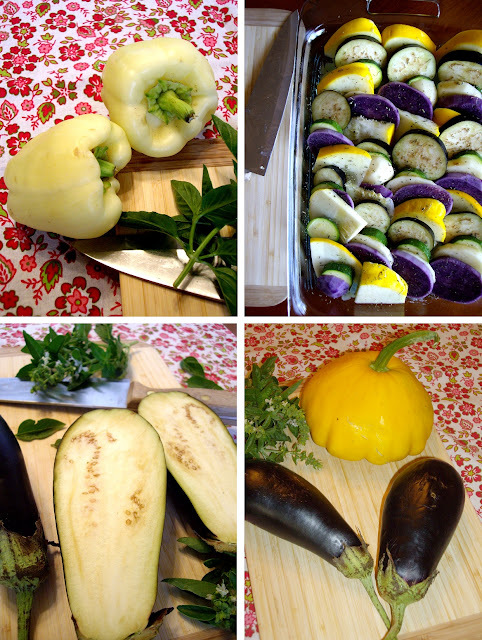 You make Eggplant and Summer Squash Lasagne and a Provençal Vegetable Tian, of course. Ahhh . . . the lasagne. All the fresh and sunny flavours of summer in one sinfully creamy dish. Layers of summer vegetables; sheets of chewy lasagne; melted, oozy Gruyère and Parmesan cheeses; and a creamy, garlicky, lemon béchamel sauce to hold it all together. Yes, I'm supposed to be taking some time off, but I just had to share this recipe with you, really quickly. More on the Vegetable Tian later . . .
Preheat the oven to 375 F (190 C). Butter a 7 x 11 inch baking dish. Mix the grated cheeses together and set aside. With a fork mix the bread crumbs with the teaspoon of olive oil in a small bowl until evenly moist. Prepare the béchamel: Melt the butter in a medium sauce pan over medium-low heat. Add the garlic and cook 30 seconds to a minute. Whisk in the flour and cook one to two minutes longer. Pour in the milk, raise the heat to medium, and whisk until the sauce is bubbly and thick. Remove from the heat and stir in the salt, pepper, nutmeg, chopped basil, lemon zest, and lemon juice. Set aside. 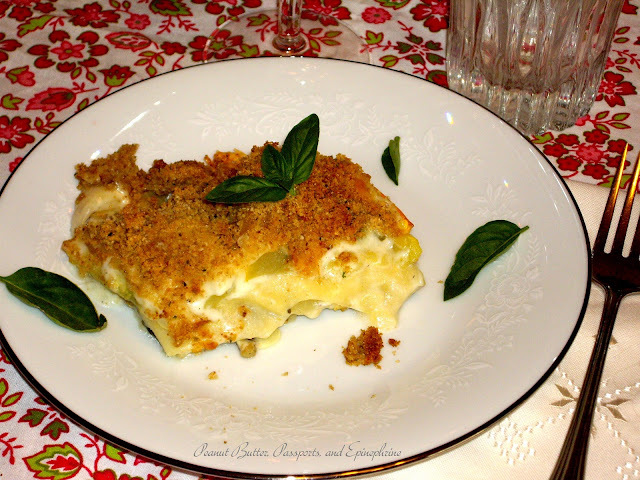 Assemble the lasagne: Spread a ladelful of béchamel on the bottom of the buttered baking dish. Place 3 lasagne sheets on top of the sauce (may break to fit the size of the pan). On top of the pasta place the sliced eggplant. Layer the slice peppers on top of the eggplant. Top the peppers and eggplant with half of the remaining sauce and half of the cheese mixture. Now add another three lasagne sheets. Top the pasta with a layer of the sliced summer squash. Add the remaining sauce. Top with the rest of the cheese. Spread the bread crumb mixture evenly over the top. Place in the preheated oven and bake uncovered 40 to 45 minutes. Allow to cool slightly before serving. Serves 4 - 6.
yum! i love this! thanks for sharing! Thanks for the invite, Marlys. I shared it on your party. Have a great day! Dawn here, one of the host from Foodie Friends Friday. Thanks for linking up with us this week. A beautiful recipe that will appeal to our veggie lovers. Great idea to do with all the veggies right now. A nice change from salads. Thanks for sharing this on foodie friday. What a delicious, seasonal and healthy meatless main dish! Whoa! I have never seen a WHITE bell pepper before, that's pretty cool! :) This looks delish too, but no dairy for me. This sounds wonderful. I love all the fresh veggies, and the lovely layers of flavour you have used. Thank you, April. And thanks for sharing it!